A photo essay from the week of September 11, 2013 in Chile, marking the 40th anniversary of the overthrow of Salvador Allende’s Popular Unity government by a U.S.-backed military coup (Part 2). Both the author and the photographer (Ben Achtenberg) participated in an SOA (School of the Americas) Watch solidarity delegation. 40 year anniversary march, 9/8/13 (Alejandro Rustom, Demotix.com)On September 8, an estimated 60,000 marched in Santiago to honor the memory of Salvador Allende and others detained, disappeared, or murdered by the dictatorship, and to demand an end to impunity for the crimes committed. 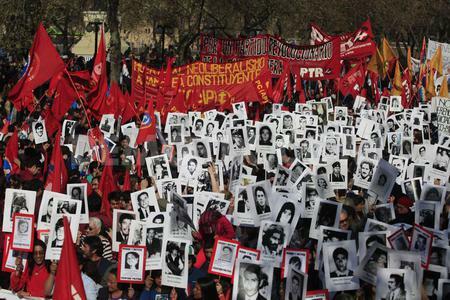 There are 40,000 officially recognized victims of the dictatorship, including more than 3,000 killed. At least 1,200 are desaparecidos whose remains have never been found. Some 200,000 Chileans—2% of the population—were forced into exile. More than 1,000 criminal cases are still grinding through the judicial system. Demonstration at Fuerte Aguayo, Concón (Ben Achtenberg).Chileans and North Americans demonstrated at Fort Aguayo, Concón, to protest U.S. involvement in a new training base for “urban peacekeeping” soldiers operated by the United States Southern Command. Chilean human rights groups fear that the facility is aimed at repressing civil unrest and social protest, especially by the Mapuche who are struggling to protect and reclaim indigenous lands. 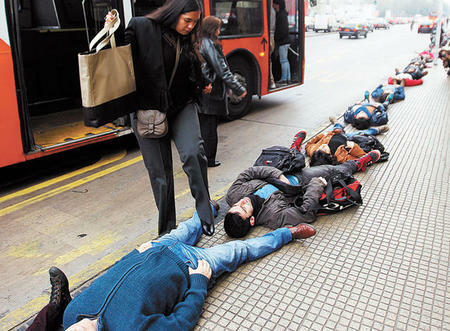 The protesters also demanded Chile’s withdrawal from the controversial SOA/WHINSEC (School of the Americas/Western Hemisphere Institute for Security Cooperation), where more than 5,000 Chilean military have been trained, including the dictatorship’s worst human rights abusers. BRP mural outside 3 y 4 Alamos, former torture center (Ben Achtenberg).These distinctive murals in primary colors by the Ramona Parra Brigade (BRP) adorn buildings and walls throughout Santiago. Founded during the Allende years, the mural collective went underground during the dictatorship but continued to paint clandestinely in resistance. Several new murals were designed for the 40th anniversary commemoration. Mural in La Pincoya (Ben Achtenberg).Like many other poblaciones (former shantytowns), La Pincoya was a bastion of support for Allende and suffered intense repression under Pinochet. Carlos Fariña, beaten and disappeared from La Pincoya by the Carabineros at age 13, was one of the youngest victims of the dictatorship. His remains were found in 1995. La Olla Comun (common pot), La Pincoya (Ben Achtenberg)During hard economic times under the dictatorship in La Pincoya, the children and families of detained, disappeared, and executed political prisoners, as well as the unemployed, were fed by the community in solidarity kitchens known as ollas comunes (common pots). Graffiti mocking theme of 1988 plebiscite (the "NO" campaign) that ousted Pinochet (Ben Achtenberg)Despite high hopes after the return of democracy in 1990, many Chileans have been disappointed with the results. The ironic rainbow graffiti (“and the happiness?”) references the 1988 “NO” campaign, when pro-democracy forces successfully mobilized a plebiscite vote against Pinochet under the slogan “Chile, la alegria ya viene!” (“Chile, happiness is coming!") After 23 years of democracy, despite its much touted “economic miracle,” Chile has one of the highest rates of inequality among developed countries. Mapuche activists (Ben Achtenberg).Chile’s draconian anti-terrorism law, a legacy of the dictatorship era, has been used by successive democratic governments against Mapuche activists accused of low level crimes like land occupations or property destruction. The law, which allows suspects to be detained indefinitely and tried in military courts based on evidence from anonymous witnesses, has been denounced by international human rights organizations. Rodrigo Melinao (brother of Hugo, left), a Mapuche land activist prosecuted under the anti-terrorism law, was mysteriously found murdered last August before his case could be re-evaluated. Student mobilization, Valparaíso, 9/5/13 (Ben Achtenberg).Chilean students, a driving force for social change, are demanding an end to the privatized, decentralized education system—another legacy of the dictatorship—which creates highly unequal educational opportunities based on social class. They want a return to the system of universal, free, public education (which they had under Allende), along with tax reform and re-nationalization of the copper industry to provide the necessary resources. Their demands, which have been partially endorsed by Michelle Bachelet, are pushing the center-left political agenda to the left. Andrés Feilbaum, FECH (Ben Achtenberg).Andrés Fielbaum, current president of the FECH (the University of Chile Student Federation), says his organization will not endorse a candidate in the upcoming presidential elections. How to translate the social pressures resulting from Chile’s massive student mobilizations into political change, he says, is an ongoing topic of debate within the movement. But a major lesson learned is that solutions must be participatory, and can’t be delegated to political parties. Constituent Assembly, student march, Valparaíso (Ben Achtenberg).Students and other progressive groups are spearheading a campaign for a Constituent Assembly to rewrite the Pinochet-era constitution, which enshrines private sector control of the economy and creates an anti-democratic electoral and legislative system. Within the center-left political coalition, there is broad-based agreement on the need for constitutional reform, but no consensus on the process by which such reform should be accomplished. "40 Years of Struggle & Resistance" (Ben Achtenberg).Forty years ago, the bodies of political dissidents were found floating in this river that runs through Santiago. This year, the banners commemorating 40 years of popular resistance were replaced as quickly as police could remove them. In the background, Michelle Bachelet’s campaign billboard showcases an endorsement by a former student leader, now running for Congress on the Communist Party ticket. For the first time since the return of democracy, the CP has joined the center-left political coalition (now rechristened La Nueva Mayoria, the New Majority).